If your spouse or significant other snores, you may have just endured another sleepless night. But it doesn’t have to be that way. There are steps you can take – or at least have him or her take – that could end the snoring and perhaps even save your spouse’s life in the process. A lot of people think of snoring as something that’s just annoying because it can cause the non-snorer to lose sleep. But it’s also possible that something serious is going on. When someone snores, it means that for some reason their breathing is being obstructed while they sleep. So if your bedmate snores it’s important to let them know, not just to complain about your sleepless night, but because their health may depend on it. •Get tested for sleep apnea. The National Sleep Foundation reports that about 18 million American adults suffer from obstructive sleep apnea, which can be a dangerous condition. People have literally choked to death or died in their sleep because of sleep apnea. If a patient has sleep apnea, one potential solution is an oral appliance that a dentist can provide. 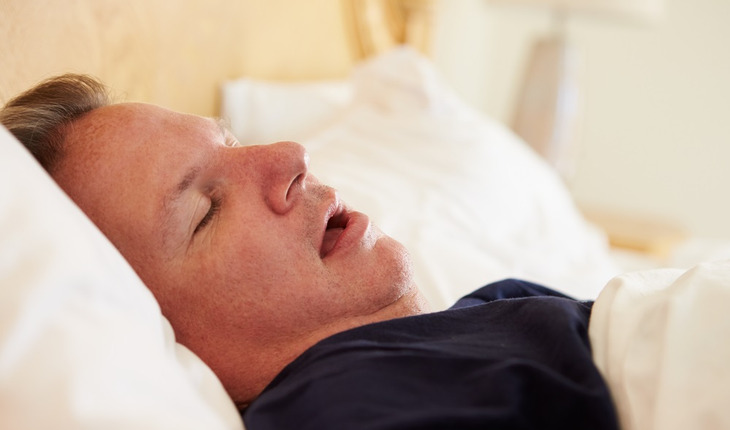 But many people never even know they need to take care of the problem because it’s estimated that about 90 percent of obstructive sleep apnea cases are undiagnosed, according to a report from the National Institutes of Health. •Change sleeping positions. Sleeping on your back will increase snoring and, in addition, worsen your sleep apnea if you have that. Try sleeping on your side instead. •Watch your weight. Yes, extra weight can lead to snoring. Weight gain can cause a person to develop a thicker neck, which contributes to a narrowing of the airway. That narrowed airway can cause snoring as well as wake the person up several times a night as the tongue obstructs the airflow. •Practice good sleep hygiene. You might expect a dentist to talk about oral hygiene, but sleep hygiene isn’t a phrase that typically comes up for most people. Sleep hygiene is really about getting better sleep by creating a welcoming environment in which to sleep, and then by having habits throughout the day and evening that prepare your mind and body for a peaceful night’s sleep. Poor sleep habits, such as staying up too late, can lead to more snoring. •Dust. It may be time to clean house – or at least the bedroom. Not only will you get rid of clutter, you could get rid of snoring. Sometimes people have trouble breathing through their nose because of an allergy, and so when they sleep they breathe through their mouth and they snore. The culprit behind the allergy could be dust, which collects on books, papers and other items. When it comes to health, there’s a tremendous amount of information out there about good nutrition and exercise, but for some reason sleep and snoring get overlooked. It’s important, though, for anyone who snores to get evaluated by a qualified professional. And anyone who knows someone who snores should urge that person to get checked.